The inspiration for Harradine’s figures In The Stocks and Tildy! As you’ll be aware a particular interest of mine is tracking down the inspiration of figures, particularly early ones and more particularly those of Leslie Harradine, Royal Doulton’s genius sculptor. Above you can see Tildy HN1576 together with her inspiration drawn by Jennie Harbour who provided many such ladies for Harradine; whether she was aware of this is unknown. (The Doulton lady is taken from the lady on the left.) 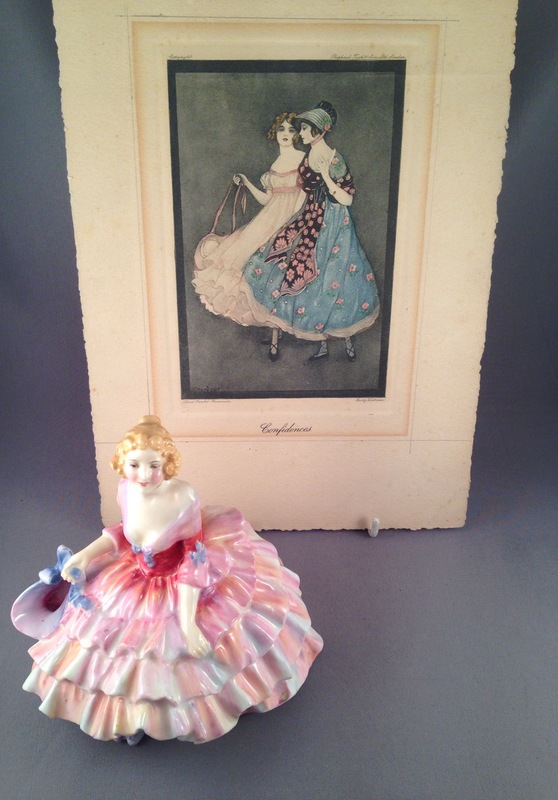 Yet, Doulton did have some agreement with Raphael Tuck the publisher of these Jennie Harbour pictures, although correspondence between the two firms that exists only refers to pictures by Stanislaus Longley and Molly Benetar. Here you can also see Harradine’s In the Stocks HN1474 who would be adapted to become Tildy. And here is HN1475 the other colourway of In the Stocks. Both versions of this lady taken from the Harbour picture are very rare today and so both had limited production, even more limited than is suggested in the figure book. In the Stocks was introduced in 1931 and Tildy in 1933, suggesting the former had been deleted by then. Tildy it is recorded, was withdrawn in 1939, but by 1939 would be a more accurate description as I have never seen a later 1930’s dated example. Perhaps someone out there has?